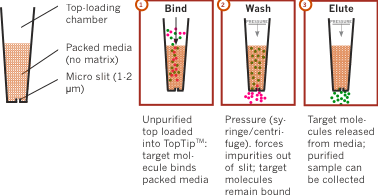 Glycopeptide/Glycoprotein Enrichment TopTip micro-spin column, allows selective recovery of glycosylated peptides/proteins known to have important biological function in immune regulation, inflammation, cell-to-cell adhesion, and cell signaling. The fine slit at the bottom of the TopTip (slit width: 1-2 µm) permits liquid to pass through, but retains media in the tip. This unique design eliminates the need for a filter – reducing dead volume, loss of sample and contamination risk. Lectins: N. I. Taranenko, et al. Effects of Lectins Affinity Chromatography on Glycoproteins Enrichment Using AP-MALDI Ion Trap Mass Spectrometry. Proceedings of 52nd ASMS Conference on Mass Spectrometry and Allied Topics (2004). SAX: Ming Lei, et al. Sequential Enrichment of Sulfated Glycans by Strong Anion-Exchange Chromatography Prior to Mass Spectrometric Measurements. J Am Soc Mass Spectrom, 21(2010), p. 348-357. Click the button below to add the Glycopeptide/Glycoprotein Enrichment TopTip to your wish list.